President Donald Trump's administration is big on saving the coal industry. A new plan would treat the issue as a matter of national security. President Donald Trump is an ardent supporter of the struggling coal industry, and he's got a new plan to bail out plants — by framing their survival as essential to the U.S. national security strategy. 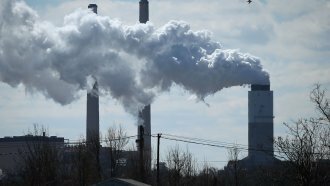 Since the early 2000s, coal and nuclear plants have struggled to stay competitive while natural gas took over as the main energy source for the U.S. A survey of coal plants last year predicted 163 out of roughly 700 were likely to close in the near future. And from 2016 to 2017, eight nuclear reactors announced their closure. The Trump administration says it needs to help these sectors rebound because they're more resilient than other power sources and can better withstand cyberattacks or natural disasters than renewable sources. The White House also claims that in an emergency, those plants could redistribute power faster than wind and solar farms because they maintain readily available on-site stockpiles of fuel and don't have to worry about the weather to make power. Energy Secretary Rick Perry said the policy is necessary because "premature retirements" of coal plants could make our nation's power grid more vulnerable. To keep them open, the government is expected to enforce national security laws requiring electricity distributors to buy a certain amount of energy from coal and nuclear power plants. Some policymakers and energy experts are criticizing the proposal, saying the U.S. does not have an energy resiliency problem. Rep. Don Beyer of Virgina called the plan "blatantly corrupt" because it "rewarded" coal industry leaders who donated money to Trump during his presidential campaign. Studies have also shown the U.S. power grid isn't getting weaker by the decline of coal and nuclear plants. Between 2012 and 2017, only seven-hundred thousandths of a percent of power disruptions in the U.S. were caused by fuel supply problems. Most of those cases were the product of downed power lines, like what occurred in Puerto Rico last year from Hurricane Maria. Experts also note that coal and nuclear plants are just as susceptible to being shut down from a cyberattack or natural disaster. For example, coal-fired plants in Houston went offline during Hurricane Harvey last year. North America saw several plants shut down in the polar vortex of 2014.